Strength - Power - Recovery! More evidence exists that creatine is safe and effective for exercise performance than any other supplement on the market. 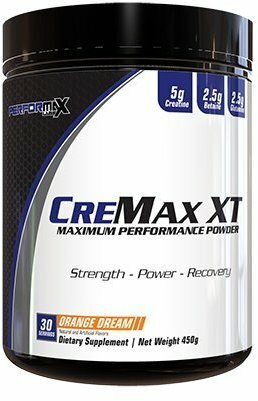 Hundreds of studies support that creatine improves power, strength, muscle mass, hydration, and performance of high-intensity exercise. Creatine monohydrate is the most researched form of creatine available. A meta-analysis (2003) of 100 studies showed significant benefits on body mass and lean body mass from creatine supplementation. Del Favero et al. (2012) showed that 10 days of creatine supplementation significantly increases the 1-repetition maximum in both bench press and squat, indicating that both upper and lower body strength increase after creatine consumption. Magnesium creatine chelate is a unique form of creatine that is absorbed into the muscle through a different transport mechanism than monohydrate. Pairing it with monohydrate produces synergistic benefits by increasing overall transport and effectiveness of creatine. Consumption of magnesium creatine chelate for two weeks increased quadriceps strength and muscular hydration compared to creatine plus magnesium, suggesting that the chelate increased transport into the muscle. Creatine anhydrous is the same as creatine monohydrate, but without the water molecule attached. Therefore, each gram of creatine anhydrous contains more creatine than creatine monohydrate. Creatine anhydrous is the purest form of creatine available.